ARLINGTON, VA, September 25, 2014 –PBS KIDS today announced the launch of Arthur’s Big App for iPhone, iPad and iPod touch, a new app inspired by the hit series ARTHUR. Designed for children ages 6-8, Arthur’s Big App encourages positive social skills through fun and engaging multi-level games. Focusing on the values of friendship, teamwork and helping others, each game allows kids to explore Elwood City and interact with their favorite ARTHUR characters. Arthur’s Big App launches just in time for the premiere of ARTHUR’s 18th season on PBS KIDS. Starting Monday, September 29, families can join Arthur and his friends for a week of new adventures that explore childhood challenges with heart and humor, while teaching problem-solving and pro-social skills. The fun continues on the ARTHUR website, where kids, parents, caregivers and teachers can access a variety of fun and educational games, lesson plans, and activities. 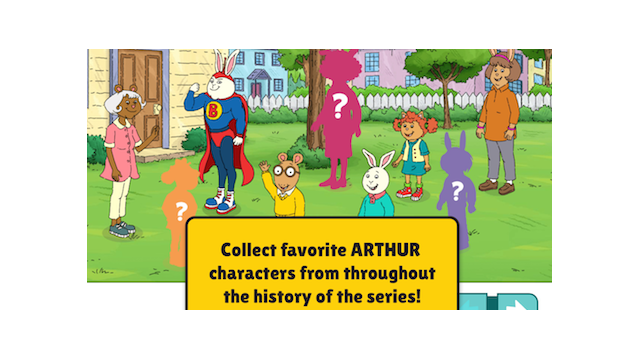 Arthur’s Big App is part of PBS KIDS’ ongoing commitment to help kids learn through educational media. The organization offers a variety of apps to help build school readiness skills. More information on PBS KIDS apps is available at pbskids.org/apps. Arthur’s Big App is available for $2.99 on the App Store for iPhone, iPad and iPod touch or at www.AppStore.com/PBSKIDS. Images of Arthur’s Big App are available on PBS PressRoom. ARTHUR, based on the best-selling books by Marc Brown, is television’s longest-running children’s animated series. Over the past 17 seasons, ARTHUR has remained one of the highest-rated weekday children’s series on PBS among children 4-8. ARTHUR has won numerous awards, including the George Foster Peabody Award, a BAFTA and seven Daytime Emmys®-four for Outstanding Children’s Animated Program. ARTHUR is produced by WGBH Boston and 9 Story Entertainment. Executive producers are Carol Greenwald (WGBH), Vince Commisso (9 Story) and Marc Brown (Marc Brown Studios). Directed by Greg Bailey. Funding for Arthur is provided by public television viewers. Corporate funding is provided by Chuck E. Cheese’s®. For more information, visit pbskids.org/arthur and follow ARTHUR on Facebook and Twitter.